Transformers Generations Selects bring back favorite characters from across the globe as exciting entrants into the Cybertronian Wars. Big robots join the Siege with this Transformers Generations Selects Deluxe Red Swoop Figure. Red Swoop is compatible with Combiner Wars and Power of the Primes Deluxe and Voyager toys (sold separately) to serve as a limb in a custom giant robot like Volcanicus. 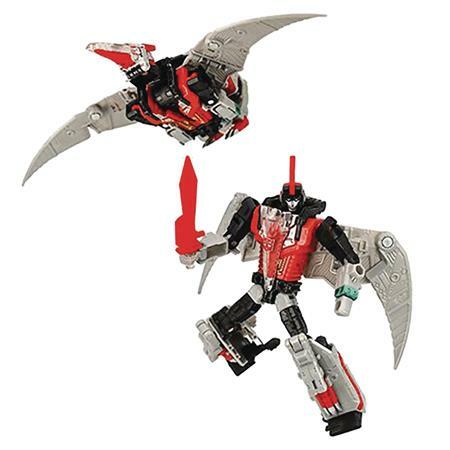 Autobot prehistoric creature transforms from pteranodon to a robot with a fist and a sword. Red and clear pteranodon inspired by the original toy deco of the original 1985 Swoop release in the USA.